Thirty years ago, I wrote an article for the journal on the potential for Brethren in Christ fiction in which I reviewed a Mennonite novel and advocated for fiction to be written with a Brethren in Christ setting. At the time, I was not aware of any fiction that had been written about the Brethren in Christ. In fact, I learned about Janice Holt Giles and her writings about the Brethren in Christ in Kentucky for the first time when Mike Brown contacted me awhile back regarding an article he had been working on about this Kentucky writer. Mike has been working on the lead article for this edition of the journal for many years. You’ll notice that some of the interviews he conducted as part of his research are dated 1986, a full 30 years ago. The result is a thorough and fascinating analysis of how Janice Holt Giles and her writings intersected with the ”White Caps,” as the Brethren in Christ in Kentucky were known among the locals in the 1940s and 1950s. Not only does the article analyze that intersection of fiction and real life, but it also offers insights into the Brethren in Christ Church in a certain time and place, when the church was more separate from surrounding culture and yet having an impact on local communities. Mike describes in detail how Brethren in Christ individuals, doctrines, and practices are featured in Giles’ novels and other writings and evaluates the lasting impact of her writing. The lengthy article is in three parts: 1) the background and context for Giles’ writing about the Brethren in Christ in Kentucky; 2) what and how Giles writer about the Brethren in Christ; and 3) the influence of her books, especially the novel that is most explicitly about the Brethren in Christ, on the church, her literary standing. Mike closes the article with this intriguing comment: “The Brethren in Christ should at least know what Janice Holt Giles says about them.” He has done a noble job of telling us! Many people familiar with Brethren in Christ Missions know the dramatic story of Myron Taylor and how his missionary service in Northern Rhodesia (now Zambia) was cut short when he was mauled by a lion and later died. In the second major article in this edition, the first part of a history of Sikalongo Mission in Zambia, Dwight Thomas fills in the details of the years leading up to that singular tragic event. Journal readers will recall that the April 2016 included an article by Jan Engle Lewis that featured Myron Taylor’s daughter Anna’s memories of her childhood in Africa. You’ll note that a couple of the photographs from that article are reprinted with this new article. Dwight and his wife Carol began working under the Zambia church in 2001, mostly at Sikalongo Bible Institute. They’ve spent three months each year at Sikalongo Mission since 2001, and Dwight did a one-year sabbatical there. Throughout those years, Dwight has done extensive historical research related to the Zambian Brethren in Christ Church, including the history of Sikalongo Mission Station. He has also been researching the biographies of Zambian workers who helped to build the church. In 2014, the bishop asked Dwight and Carol to help the church launch a Christian university in Zambia’s Southern Province. In preparation for the one hundredth anniversary of the founding of Sikalongo Mission, celebrated at the General Conference of Zambian Brethren in Christ Church in August 2016, Dwight worked with church leaders to prepare a history of the mission. This first part of the history covers the period from initial planning in 1910 to open a new mission to the death of Walter Taylor in 1931. The second and third parts of the history will be published in subsequent editions of the journal. We conclude with several book reviews, covering such diverse topics as Amish singing and adolescents, John Wesley, American evangelicalism, and higher education. 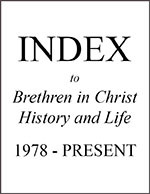 While none of the books being reviewed is specifically about the Brethren in Christ Church, all the topics are related In some way to our history, theology, and current concerns. In the April edition, in Jan Engle Lewis’ article, “Through the Eyes of a Child,” one of Harvey and Emma Frey’s daughters is incorrectly named Ruth in photo captions on pages 6, 7. and 8. The correct name is Lois. In the photo on page 7, their son is incorrectly named Lester. The correct name is Ernest. Also in the April 2016 edition, Hank Johnson, new Historical Society board member and author of one of the essays on “Why I Serve at the Denominational Level,” was mistakenly listed in several places as Hank Williams. Harriet Bicksler, “Some Thoughts on the Potential for Brethren in Christ Fiction,” Brethren in Christ History and Life 13, no. 1 (April 1986), 92-100.